blessed life is the same: choose wisdom, follow God, and you’ll be blessed. Included in this gift set is pen and leather journal set to faciliate taking notes while reading the book. May God bless you with His knowledge, wisdom, understanding, counsel and the fear of the Lord as you use these materials to study the book of Proverbs. 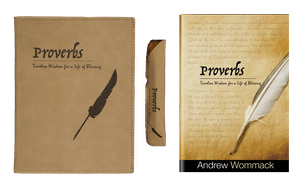 ahold of Andrew’s teaching on Proverbs for the timeless wisdom you need to live a life of blessing!